Emily shares what it was like to take that first step toward building an agency. She shares tips for managing 50+ clients and offers her own secrets for training and mentoring a team of employees. Her secret to building collaborative business relationships is invaluable for freelancers. So if you’re thinking about building your own agency, this episode of The Freelance Transformation is for you. Don’t expect your agency to build itself overnight. There are steps you need to take and processes you need to put in place in order to have a successful business. Emily recommends following what you’re good at. Doing what you love is a great way to stay motivated. It wasn’t an overnight decision. It was more just following what I really enjoyed and was good at, and then scaling and making money with this specialized offering. Emily’s first step in this transition was to break away from the cycle of hourly pay. She started offering her ad management skills in affordable packages for clients. This tactic allowed her to not only earn more money but build a reputation for herself as a successful Facebook ad manager. From there, her business could bloom. Emily built her business around the same time she was building her family. As a mother of two, Emily wanted time to be there for her children while still making money doing what she loves. Finding that work-life balance is important to freelancers. Running an agency can give you that kind of autonomy. But it doesn’t come easy. Finding support is key to building a successful agency. Emily is actively involved in Facebook groups and high-level mastermind groups in order to find the support she needs. It’s very powerful to surround yourself with people who are above your level or at your level only and can support you. Emily only joined these groups last year because she was looking for guidance. On her way to a seven-figure business, she sort of plateaued. She knew she needed to build a team but had no idea where to start. Being a part of a community gave her a space to talk to other entrepreneurs who have similar experiences. This community helped her develop the systems and processes she needed in order to successfully train her staff. Joining mastermind groups is not the first step to building an agency, but it is an important stepping stone on the way to building a brand. It’s not something to take lightly, either. Mastermind groups are a sizeable investment. Emily had the money to invest in her business, and she credits her hustle as the key to her success. I didn’t invest in coaches or masterminds until I had a business that was making me money. Those are meant to take you to the next level, but you have to hustle and get yourself to a certain point on your own. No matter how successful you are in your business, there are always opportunities to learn something new. As Emily says today, there is no guidebook for being a leader. While her digital marketing skills are something to envy, Emily did not have the skills necessary for managing and training people. By participating in mastermind groups, Emily was able to pick the brains of fellow solo-preneurs in order to design her own training program. Without any leadership skills, training and managing a staff can be incredibly difficult for freelancers. Emily turned to mastermind groups for help, but she also had a few habits of her own that contributed to her training program, something she calls “The Hirsh Process”. To start with, Emily wrote a “time study”. She wrote down what she did all day every day for two weeks. Then, she picked out the tasks that she could outsource to assistants and other ad managers. Writing down and visualizing your work in this way can help you break down the roles you need your new staff to fill. 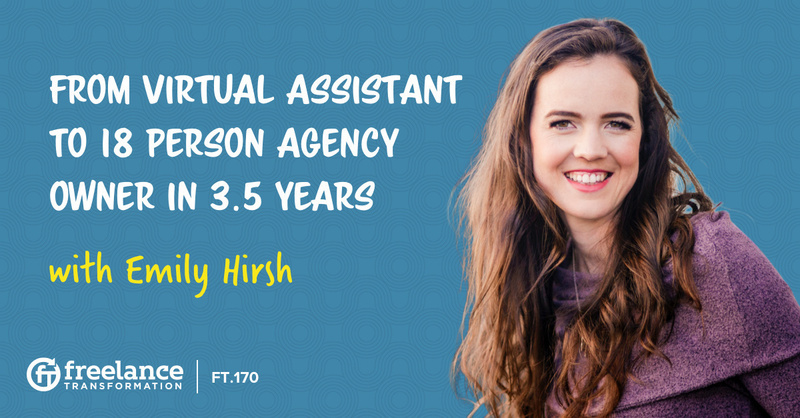 Emily breaks down her Hirsh Process for us today and explains how she trains her ad managers and strategists. The faster I can train ads managers to be able to represent the company as if I was running the ads, then the more the clients we can take on and the faster I can grow. One of the most important things we talk about in today’s episode is how to build trust in your new hires. Handing off key tasks to virtual assistants can be nerve-racking, but Emily shares tips and tricks to make this transition easier. There are so many tiny details that you’re bound to miss something, but Emily reassures us that running a business is a learning process. You just have to teach your staff your unique way of running things. Emily created her training program with videos, workbooks, and a test to confirm her staff’s skills. You don’t want to teach them everything, so it’s important to find employees who already have a few years of experience in your realm of business. You want to hire people who know what they’re doing so all you have to train is your unique perspective. It won’t be easy, but it will be worth it in the long run. It’s never going to be perfect. It’s always going to be improving and growing, and that’s fine. That’s just the reality of business. Emily’s training technique creates a collaborative business relationship between herself, her clients, and her staff. This kind of relationship involves working together in all aspects of her business, but Emily no longer manages the day-to-day tasks of her business. With her training in place, Emily is free to focus on the bigger strategies while still having enough freedom to spend time with her family. She can choose to talk to clients if she wants to or let her staff handle the details. If you’re looking for this kind of freedom, then pay close attention to the knowledge Emily shares with us today.